CresTechnologies, Inc., an engineering company based in Pittsburgh, USA, needed to visualize a new process for producing clean-burning coal for an upcoming technology expo. The animation needed to support live narration — giving the presenter control over the playback of the animation — and they needed it in less than a month. 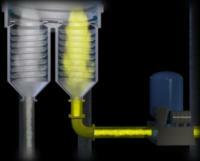 CresTechnologies, Inc. had invented a new coal refinement process but had no visual way to communicate it. 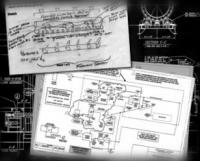 CresTechnologies, Inc. had various diagrams and process flows that were visually complex and did not communicate well to their audience, ranging from other engineers in the field to managers and government officials in the energy sector. In addition, the project needed to be delivered in less than a month, in time for the debut appearance in a technology expo booth. The animation needed to highlight the system’s ability to reclaim water and gasses, recycling them as components used again in the process. Visual distinction between byproducts; how they are handled in an environmentally friendly manner, and how the process actually creates a surplus of energy, were critical messages. In addition, the client needed controls to allow the presenter to jump between selling points during his talk. Deliver on DVD?… Computer screen? Not having minutes to burn we left this question for later and jumped right into planning and production. After Creative Brief was written and approved, we began with the client’s basic storyboards and delivered, within a week, 3d previz using models created from client-supplied CAD drawings. Previz allowed us to quickly see how timing, scale, composition communicated the desired message. This helped the client get involved in the direction, offering their much-needed engineering expertise, giving our work authenticity. Animation length was guided by the client’s desire to talk through the process features while the animation played back. Typically these marketing videos last about five minutes and include integrated audio narration; this more relaxed approach brought the final run time to just over eight minutes and was to play a secondary role to the presenter. The presenter led by supplying the audio and general timing while the animation supported his role with the visuals. Throughout the animation, 3d text objects labeled key features. A chapter menu was added to the normal playback controls allowing the presenter to select a “chapter” at will. Production time was balanced between the eight-minute camera work and generating 2d particle effects to represent the circulating gasses and liquids. Unique color and texture assignments were used to indicate temperature and the type of gas, or liquid. Lighting played a major role in highlighting features, including energy-saving — and energy-producing features of the CresTechnologies process. There was some uncertainty surrounding the final mode of delivery (personal computer or DVD set-top) so we rendered the animation at standard definition, allowing a wider range of publishing formats. The client finally settled on the QuickTime container format which allows playback on Windows or Macintosh computers. Chapter Markers that were originally added to the edit for DVD playback, were migrated to the movie file, allowing the presenter to navigate the selling points using a menu in the QuickTime Player. Throughout the production process, regular client reviews ensured we stayed on track with established goals and allowed for some changes to be made which enhanced the final message.